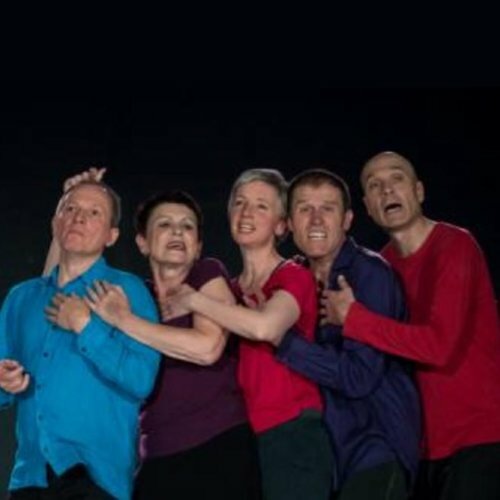 The European Action Theater™ Ensemble (EAT) was founded in 2006, in Berlin, by Sten Rudstrom, in order to create a group of professional performers who practice and teach of Action Theater™ as a common ground.. Action Theater is an improvisation training developed by Ruth Zaporah. The body-oriented improvisation method treats movement, voice and language equally as expressive forms of improvisation. Comparable to the improvised music, the performers work with their own bodies as an instrument in empty space. The stage is empty, no props to influence the imagination, pure improvisation creates the script. Actions of the ensemble are unpredictable; gestures are unexpected and spoken words surprising. The EAT ensemble performs in unknown territory—unknown to them and to the audience. Anything may happen. With each step, vocal sound, or spoken word, the unknown takes shape. It transpires into something that never was and never will be again. The performers enter the empty stage without a plan. Physical improvisation, imagination and life experience create a unique voyage of wild episodes, absurd characters and mysterious scenes.